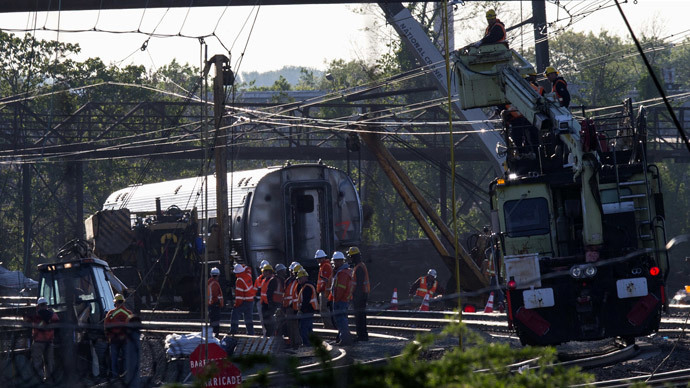 Eight people have been killed as a result of this week's Amtrak derailment in Philadelphia, Pennsylvania, officials said. The investigation is ongoing, but new data shows the train accelerating rapidly in the minute before the crash. At a press conference, Robert Sumwalt of the National Transportation Safety Board said that a forward-facing video from Amtrak train 188 shows it surpassing 100 miles per hour in the last 16 seconds before it stopped recording. He added that just before entering the turn, the train's engineer applied emergency braking. Only seconds into the turn, investigators could see the train tilting 10 degrees to the right before recording went blank, Sumwalt said. So far, it's unclear if the train's acceleration was done manually, but Sumwalt said he was confident that "positive train control" technology would have prevented the accident. Using combination of technology such as GPS, postive train control can keep trains from speeding. "Based on what we know right now, we feel that had such a system been installed in this section of track, this accident would not have occurred," Sumwalt said. Contrary to rumors, NTSB has contacted the train's engineer and he has agreed to be interviewed. Meanwhile, Philadelphia Mayor Michael Nutter said the body count from Tuesday's tragedy has reached eight. Officials were asked to bring a cadaver dog to the scene of the derailment earlier on Thursday and were able to locate the remains of the latest confirmed casualty. “We did recover the remains of one individual this morning. Those remains were taken to the medical examiner's office as is our protocol. The remains have been identified as a person who was on that train,” Nutter said. According to Mayor Nutter, all the people who were believed to have been on train 188 on Tuesday evening have now been accounted for. Forty-three remain hospitalized as of Thursday afternoon. The eight dead have been identified by family members, co-workers or friends, according to the New York Times. The most recently identified casualty is Robert “Bob” Gildersleeve, 45, who worked for the environmental engineering company Ecolab. The Italian embassy has identified one of the victims as their national, Sardinia businessman Giuseppe Piras. They said he was in the US on business. Laura Finamore, 47, was an executive at the real-estate firm Cushman & Wakefield. Jim Gaines, 48, worked for the Associated Press. Abid Gilani, 55, was a senior vice president at Wells Fargo. Derrick Griffith, 42, was the Dean of Students at Medgar Evers College in New York. Rachel Jacobs, 39, was the CEO of ApprenNet, an education technology company in Philadelphia. And Justin Zemser, 20, was a midshipman at the US Naval Academy in Annapolis, Maryland. According to the NTSB, the accident site has been released back to Amtrak, though the investigation is not over.